Grizzly Records just sent me their latest release from Boomsnake and I was poking around and found this interview from San Diego Citybeat. 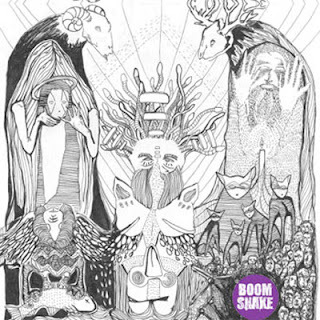 Boomsnake is the vision of Gabe Rodriguez who incidentally did the great black and white cover art for the single, and on their site. It sounds like he's worked with a variety of people in Portland, NY, and San Diego developing the multi layered massively precise sound over the course of touring and reworked some of their previously released material for the A-Side with a brand new one on the B-Side. This is a long player at 33, with a 7 minute A-Side, but these tracks need their space to spread out and really take time to develop. They are slow burners, full of unexpected rhythms, full of serious song crafting, they aren't the result of an afternoon jam, it's been a long road of development, tweaking an odd time signature, adding that extra layer of background vocal. Like 'Busy' the second track on the A-Side, which has a dense animal-collective style percussion, clackity rim shots with tom rolls, which start and stop on a dime. I'm getting the idea this is in line with that modern primitive aesthetic of These Are Powers without the grating electronics. Boomsnake is drawing from ancient tribal sources going in a folk pop direction at the end of the day. All with Gabe's vocals at the center of this universe, back and forth verses, layered harmonies, sometimes just abstract vocalizations floating around, completely opaque...there's no spaces, nothing gets through. The B-Side 'Sampled Demolition' has lots of changing percussion rhythms again, if that sounds like a vague description it's because it could very well be live and/or programmed, but none of it is a traditional snare or kick. Somehow it's never overdone, sounds that are there for the sake of surprise. It's a really definitive, very subtle but ultra dense background of handclaps rimshots, snaps, low high hats? With headphones on you'll actually turn around to see whose making that noise behind you. A jazzy electric guitar against an acoustic keeps it tethered to the melody while the rest flows around in between quiet electronics and atmospheric vocal sounds slowly creeping in the background. His high register voice, close to falsetto, is a little bit like Thom Yorke in some of the wavering phrases. It's a huge sound, but not in volume, it's the sound of someone who can easily make the case for being at home with an insane array of devices, using everything to it's potential. Boomsnake's new EP, Re/Visions, is exactly what the title entails, the same old songs reworked. 6 of the 7 tracks on the EP are re-recorded songs taken from the bands previous releases (Give and Take LP 2008, Vitamins EP 2009). After their US tour in April/May 2009, Gabe Rodriguez and the rest of the band, then comprised of Nathan Aguilar, Cory Stier & Chelsea Hernandez, decided upon recording the set they had just played 40+ times across the country. The recordings were engineered/mixed by Adam Lathrum at Barn Studios in Rancho Santa Fe, CA. The lone new track on the EP, Sample Demolition, further shows Boomsnake's new musical direction from once 2-piece minimal/singer/songwriter to a 5-piece indie/ambient collaboration. The accompanying 7" will feature "Sticks, Stones & Animal Bones" and "Busy" from the Give and Take LP along with "Sample Demolition" filing side B.